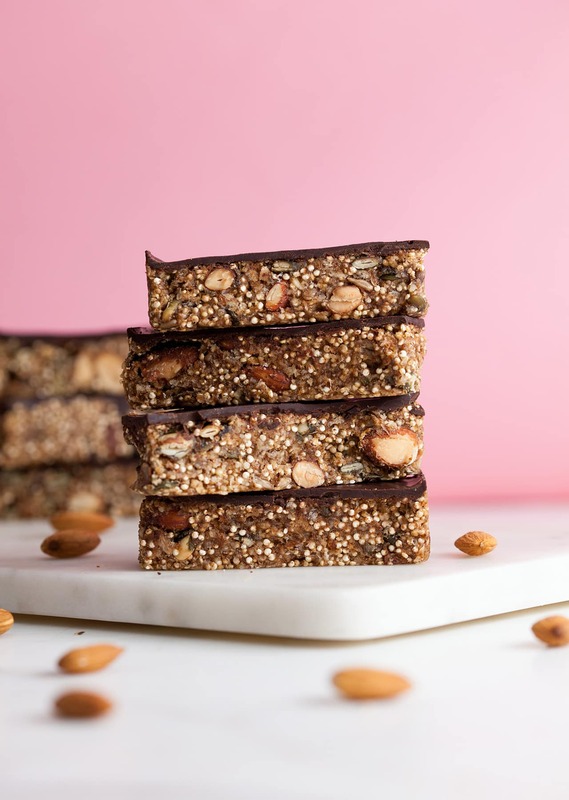 We always carry around homemade energy bars ready for when that hunger hits. Honestly, nothing beats making your own healthy snacks at home. 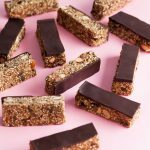 These quinoa energy bars are totally unique and super easy. 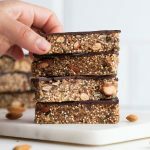 Quinoa is also a complete protein so it contains all the amino acids needed to build protein, making these bars the perfect pre or post workout snack. Preheat the oven to 180°C / 356°F fan assisted. Line the base and sides of a square 7-inch baking tin with baking paper. Transfer the medjool dates to a small bowl, cover with roughly 250ml (1 cup) of hot water straight from the kettle and set to one side to soak while you do the next steps. Transfer the sunflower seeds, pumpkin seeds, almonds, quinoa and oats to a large baking tray, and then roast them in the oven for 10 minutes. Drain the medjool dates, reserving the water, then remove and discard the stones. Add the dates to a blender along with the chia seeds, 150ml (5 fl.oz) of the reserved date water and a pinch of salt. Blend until smooth, then transfer to a large mixing bowl along with the toasted nuts and seeds, the melted coconut oil, vanilla extract and almond butter. Stir everything until fully combined. Pour the mixture into the lined baking tin and even it out by pushing down with a little baking paper until the mixture is compact. Add the dark chocolate to a metal or glass bowl, then place the bowl over a saucepan containing 2cm (approx. 1 inch) of hot water and bring the water to a gentle simmer on a low heat (make sure the water level isn’t high enough so it’s contact with the bowl). Stir the chocolate occasionally. Once it has melted completely (this will take 3-5 minutes), remove the bowl from the heat. Pour the chocolate over the energy bar mixture and tilt the baking tin to ease the chocolate to the edges. Leave to one side for roughly 1 hour or until the chocolate sets. Slice into 12 bars and store in an airtight container for up to a week. Where do you buy almond butter from ? Hey Victoria. You should be able to find almond butter from most supermarkets. If not, you can use peanut butter! 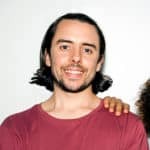 Would peanut butter work as an alternative? Yes definitely! 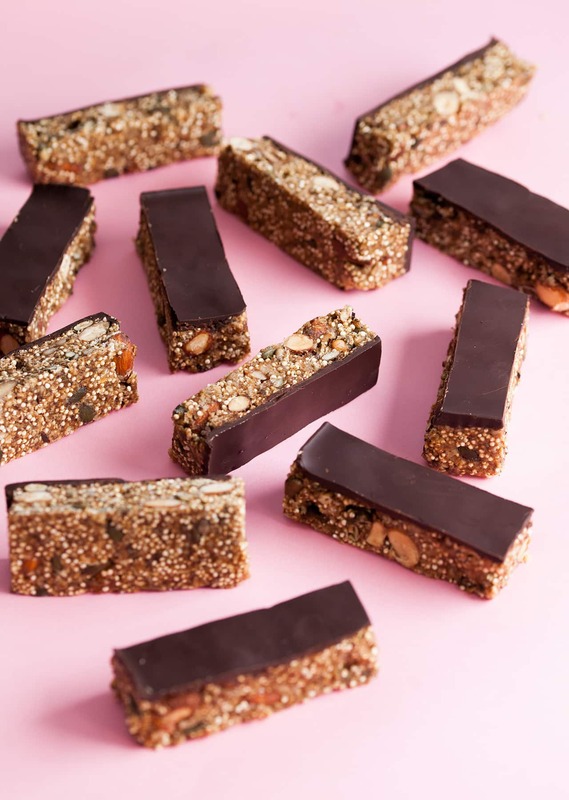 We often use peanut butter in our energy bars and it’s lovely! Hej don’t you need to wash the quinoa beforehand? That’s what it as told. Hey Anna. It really depends on what quinoa you buy. The version we buy from a supermarket is already washed and we use it raw in this recipe, so it’s fine to just throw straight in. But if you buy it from a bulk market, for example, you might want to rinse it first to remove any bits that sometimes collect in it. Hope that helps!